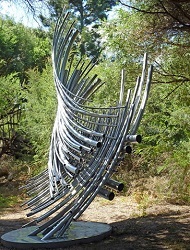 NSW artist Terrance Plowright has been announced as the 2012 Frankston City People’s Choice Award for his work tubular resonance at the McClelland Sculpture Park + Gallery. A record number of over 3500 votes selected his tubular resonance, a work that embodies elements of the massive pipe organ interwoven with aspects of the pan pipes to create a feeling for the most humble and the most grand of instruments linked together in one structure. “With this particular sculpture I have endeavoured to bring about a rhythmic flow of form and direction, punctuated by tubes that break away from the overall movement and generate a happy tension.” says artist Terrance Plowright. Terrance Plowright has worked as an artist for 25 years and has undertaken various prominent public and corporate commissions both in Australia and internationally. Major commissions include Life Teeming/Life Teaming, Waverley Council, Sydney (2011), Emergence, Newcastle Permanent Building Society, New South Wales (2006); Wings of Spirit, Lend Lease for the Water Gallery complex in Twin Waters on the Sunshine Coast, Queensland (2004) and Aqua-helix, Central Station, Sydney (2001). He has also undertaken many large scale mural and figurative commissions throughout Australia including the recent Vietnamese Boat People Memorial for Bankstown City Council, New South Wales in 2011. Plowright has also completed numerous water features, one over fifty metres in length for the Deutsche Bank Headquarters, Sydney and the Dancing Brolga Fountain at Cockle Bay, New South Wales. Terrance Plowright will represent Australia at the Florence Biennale in November 2013 and has also been invited to exhibit his work in New York in early 2015. The McClelland Sculpture Survey & Award is one of Australia’s richest and most important biennial outdoor sculpture exhibitions. The acquisitive McClelland Award of $100,000.00 was awarded to Greg Johns for his work At the centre (There is nothing) and the $30,000 McClelland Achievement Prize (MAP) was awarded to Christopher Langton for Away with the Fairies. The $20,000 People’s Choice Award is presented to the artist with the most number of votes from the public and each of the 35 finalists are eligible for this cash prize. In addition to full complimentary support McClelland provides for the installation of their work, the total direct cash support to artists participating in the McClelland Sculpture Survey 2012 is $193,200 making it the richest and most prestigious exhibition in sculpture in Australia. 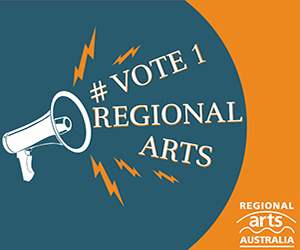 The McClelland Sculpture Survey & Award was established in 2003 and quickly established itself as the most influential and prestigious exhibition of outdoor public sculpture in Australia. It brings together a wide range of sculptors from emerging, mid-career and established artists, working in wide range of styles and different media. It truly encapsulates the best of current sculpture practice. The 35 selected Survey sculptures are displayed along a picturesque sculpture trail which winds its way through a variety of natural bush landscape and grasslands making it both an art and nature experience. The McClelland Sculpture Survey & Award is proudly supported by The Balnaves Foundation and the Elisabeth Murdoch Sculpture Fund. For more information, visit: www.mcclellandgallery.com for details.